Someone went to extreme lengths (pun intended!) to ensure that for the Winter Pool Challenge he ticked off some that no one else in London would be able to do. Excessive Brian… Excessive! Having landed on Friday morning, I went to South Curl Curl pool in the afternoon with my nephew, Zac, and sister-in-law, Kate. Suffering from jet-lag, the swim served as a good way to keep myself active and awake. I swam some relaxed lengths for about half an hour. The pool is divided into two sections: a 50m main pool, and a shallow toddlers section (which Zac took full advantage of). The pool is fed by the ocean, and I saw at least one foot-long fish swimming around, keeping my company as I swam :-). The pool was very busy, although this was mostly parents and toddlers in the shallow section. On Saturday, Kate and I did the #1 rated Sydney attraction on tripadvisor: the Bondi to Bronte walk. 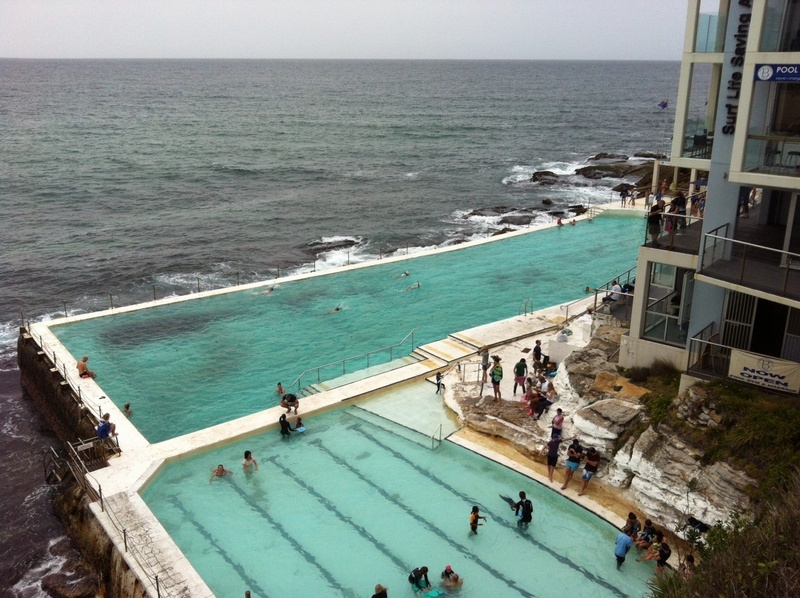 Or rather we did it in reverse, starting in Bronte and finishing in Bondi, which allowed me to head straight to the Icebergs pool for a swim afterwards. This is a fantastic venue built into the cliff-side at the south end of Bondi beach. There are two pools, a gym, changing rooms, sauna, cafe, and what looks like a very nice restaurant on the top floor. I swam in the seaward lane, so had the occasional sea spray from waves as I swam up and down. An early morning swim at Dee Why ocean pool. The “old boys” from the local swimming club were having a series of handicap races as I did some laps. All in matching blue budgie smugglers with “Dee Why” written on the back. Half the pool was in lanes for the races and the rest was open to the public, but at that time on a rainy Sunday morning, there were only a few other swimmers present. North Sydney 50m outdoor pool has a fantastic location at the base of the Harbour Bridge, and overlooking the harbour. I did my only structured session of the holiday here (the rest were long steady swims), doing sets of 200m to make up a 3km set. I spent most of the warmup/cooldown swimming head-up admiring the view. The pool is surprisingly salty, but was a great place to swim. In the middle of the day, there were about two people per lane on average. I took a couple of days off from swimming on Thursday and Friday, and cycled up to Katoomba in the Blue Mountains instead. Back in Sydney, we paid a visit to the Olympic Park on Saturday. 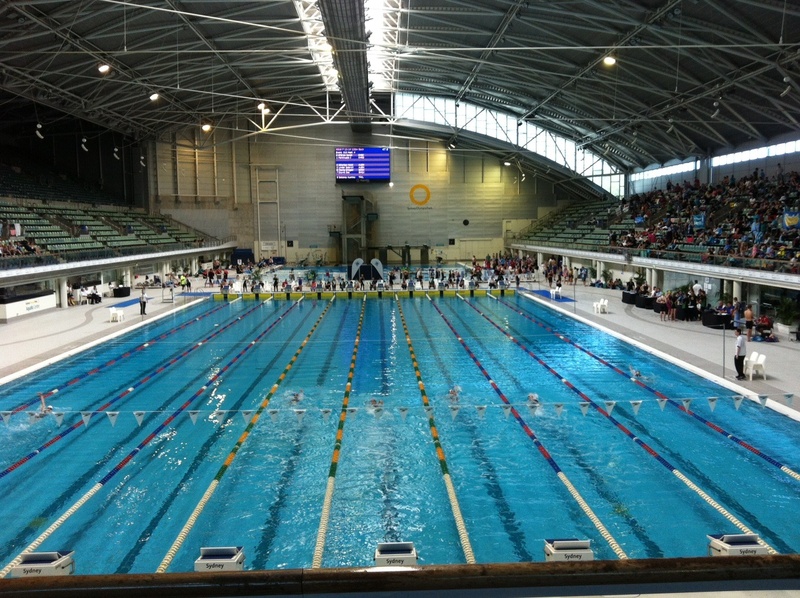 The main competition pool was closed to the public while we were there, but the warmup 50m pool and the kiddies pool beside it were both open. I must say the standard of swimmer was a long way from “olympic” (myself included…). There were a few people in the “fast lane” whose swimming style left a lot to be desired, so I spent most of my swim endlessly passing people out… A short swim as I had the Coogee Island Challenge the next day. 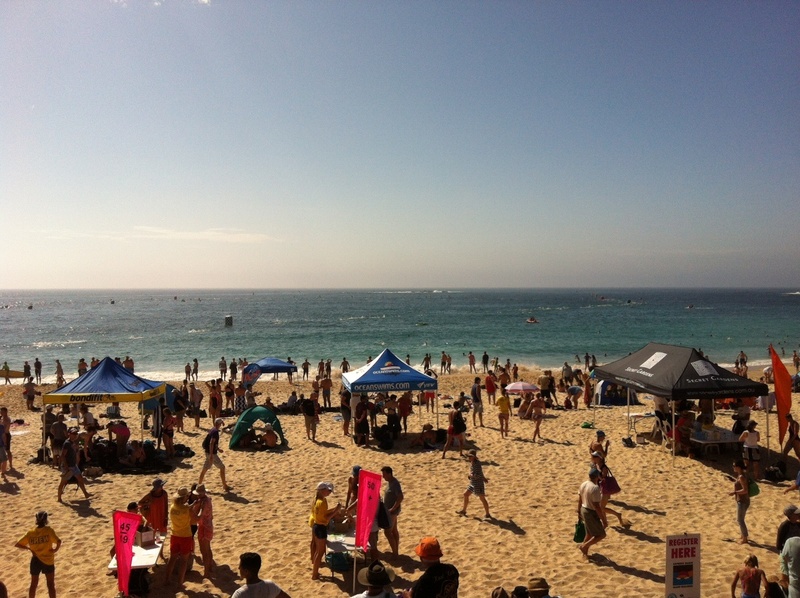 I opted for the 2.4km lap of the island, which had about 1000 swimmers divided up into waves by age. The elite wave went first, followed by waves in increasing age order. The start was very relaxed, with no argie-bargie, despite the running start. I quickly got into a rhythm and tried to stay in the centre of the pack so that I could sight off other swimmers to both sides. The water was really clear as soon as we got out of the surf, but that just meant that I could see the jelly-fish clearly! Luckily the jellies were tiny, and non-stinging, but there were literally thousands of them. The course was extremly well marked, with colour-coded buoys, so you could tell where you were in the swim (if you paid attention during the safety briefing). We caught up with the stragglers from the previous wave about half way to the island, which was sooner than expected, but gave me the boost of being able to chase down extra swimmers as I went along. The weather was really hazy — it wasn’t that noticeable from the shore, but by the time we got to the island we could barely see the coast. Thank goodness the safety cover was excellent, and I was never more than about 10m from a canoe or paddle boarder. Conditions were good with only a small swell, increasing slightly as we rounded the island. I continued to pass people on the way back into the beach, and was passed by the leaders of the two waves who started behind me. I managed to stick with the leaders of the second wave for about 50m, which gave me a nice boost on the way back in. The finish was 15m up the beach. Finishing alone, I did not need to sprint, and finished in 40:12, in 122nd place of 1032.